We moved into our new home in North Carolina 6 months ago. The rooms are functional but I am SO eager to add personality to each room. The half bath is small and is the perfect place to start! The goals are: new paint, a mirror, light fixture, faucet and accessories (more on the accessories soon!). Right now we are lack contrast between the white sink and the beige walls. And beige is boring. I am leaning toward to an aqua, teal, or navy. In our previous home we used all light grey. It was beautiful but am looking for something fun and different this time. 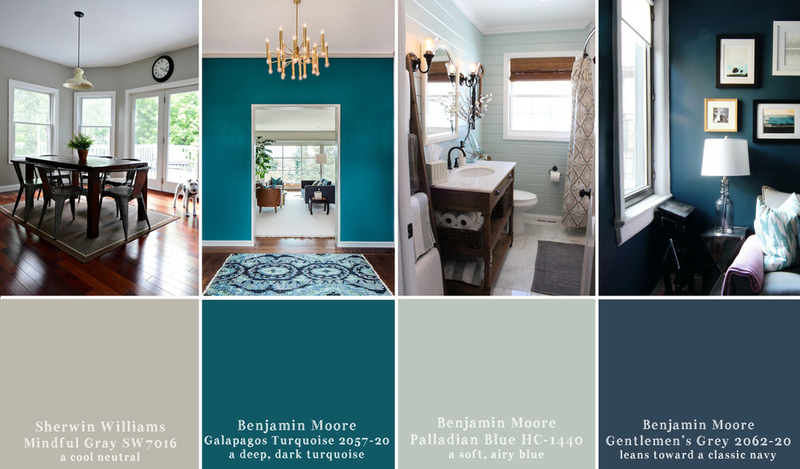 After picking up paint swatches yesterday, I narrowed it down to these 4. Galapagos Turquoise is my husband's favorite. The swatch looks a bit darker than online. I also really like Palladian Blue. It has a soft grey-blue-green tone and I think it would also go nicely in our childrens' bathroom upstairs. I would love your vote! Please pick your favorite and leave a comment!